DEWALT FLEXVOLT High Efficiency Accessories are engineered to Maximize Runtime. The hole saws feature a self-feed pilot bit for fast, efficient cutting, carbide teeth for long life, and a thin kerf design for high efficiency. For use in cordless and corded tools. The DEWALT DWAFV02916 Hole Saw is 2-9/16inches in diameter. Bosch Daredevil" Wood Hole Saws are specially engineered to be 5X faster than standard wood hole saws, using Bosch's exclusive Turbo-Teeth" design. This exclusive two-tooth pattern delivers faster drilling and longer life. These hole saws provide best-in-class results in wood and plywood applications. They have large chip clearance slots for easy plug removal, and their deep cup design was made to be the ideal choice for 2 x 4s. The Daredevil" Wood Hole Saw set includes an arbour and pilot bit for use right out of the package. 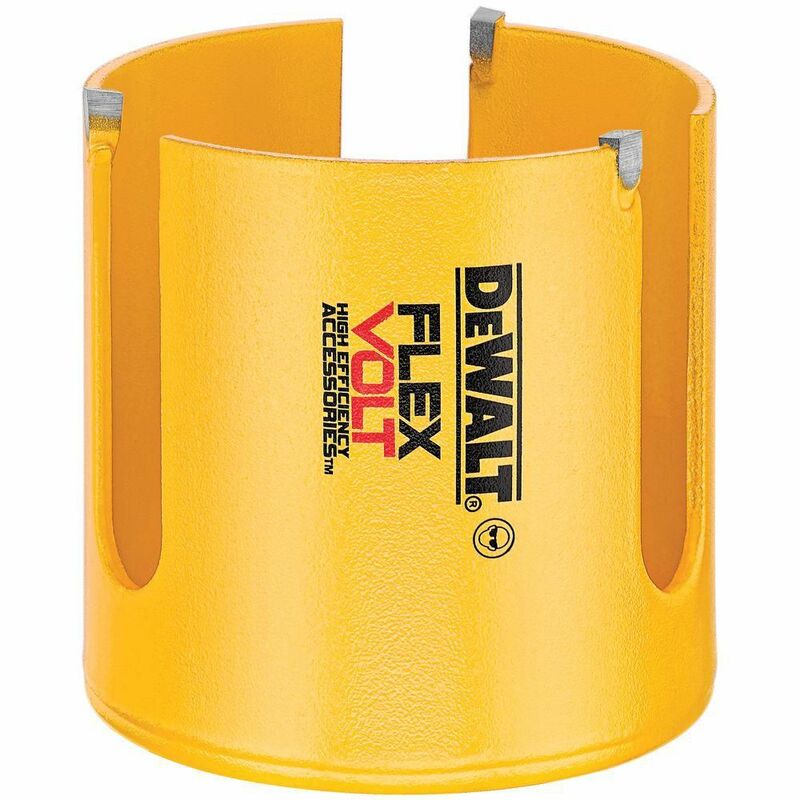 FLEXVOLT 2-9/16 Inch Carbide Wood Hole Saw DEWALT FLEXVOLT High Efficiency Accessories are engineered to Maximize Runtime. The hole saws feature a self-feed pilot bit for fast, efficient cutting, carbide teeth for long life, and a thin kerf design for high efficiency. For use in cordless and corded tools. The DEWALT DWAFV02916 Hole Saw is 2-9/16inches in diameter.